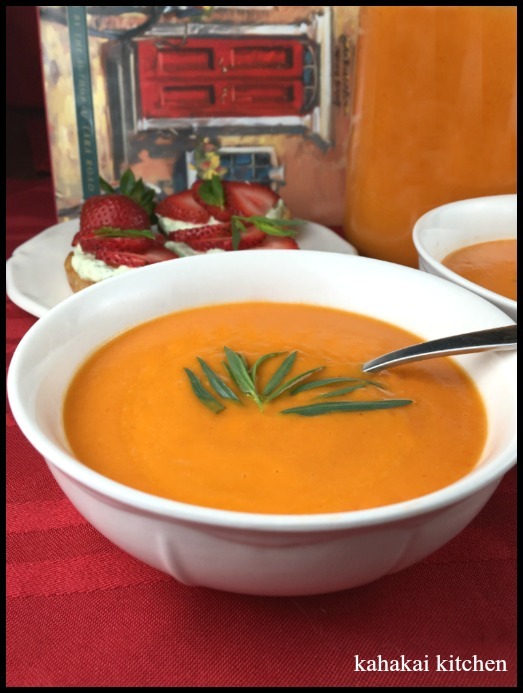 It's that time again, a Round-up at Cook the Books Club for our featured book Scarlet Feather, by Maeve Binchy, c2000, including thoughts on the novel (overall favorable) and on the dishes that everyone made inspired by their reading. For the rest of the stories, take a leisurely tour, visiting all the participants by clicking on their links, and enjoy! 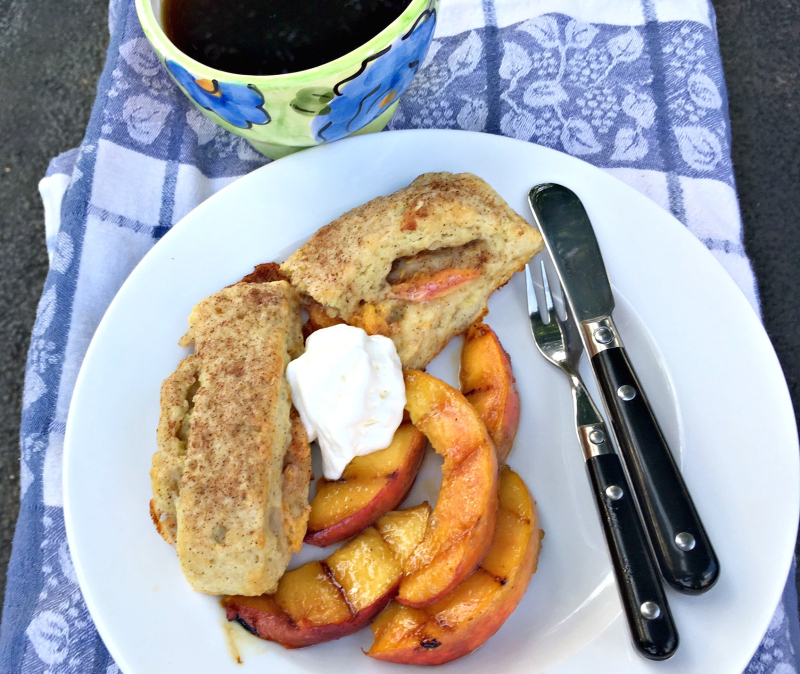 First off, in the early bird slot, was Amy of Amy's Cooking Adventures with a refreshing Summer Salad Sandwich. Amy said, "that while I was interested in the characters and their outcomes, the book really wasn’t all that exciting. It didn’t grab me or elicit any emotion (other than the fact that Neil (Cathy’s husband) is narcissistic jerk!)" 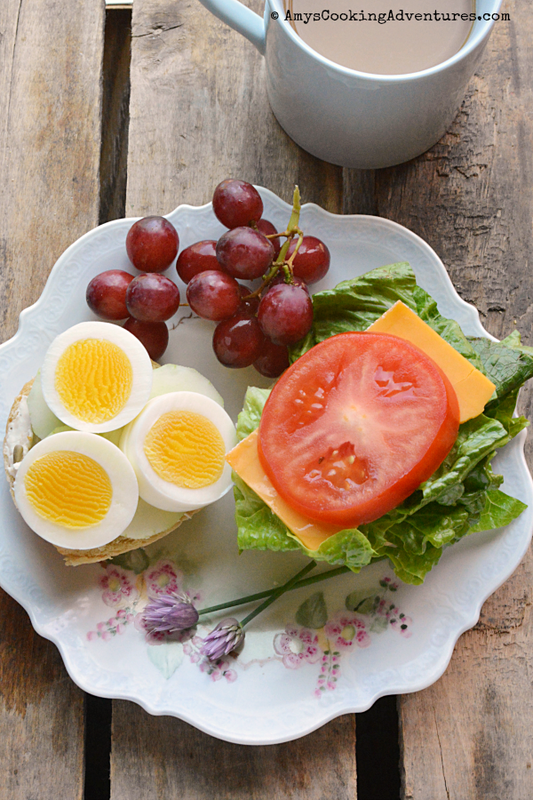 As far as food inspiration: "Funny story, this sandwich is actually mentioned when Tom is at a café with his brother and he is incredibly disappointed by the sandwich (Tom is known to criticize food everywhere he goes). It reminded me of the summer sandwiches that I practically used to live on."' And she shows how it can be done well. Wendy of A Day in the Life on the Farm, was in next with scrumptious Coconut Prawns. She says she was, "so happy to have been assigned a book that I enjoyed", though in the midst of packing up her house, she listened to the audio version, reporting that "The results are a year in their lives much like a year in ours. There were tears of joy, laughter, sadness and frustration. There were good times and bad and you felt like you were with Cathy and Tom through it all. Talk about food.....there was food of every shape, size and description. 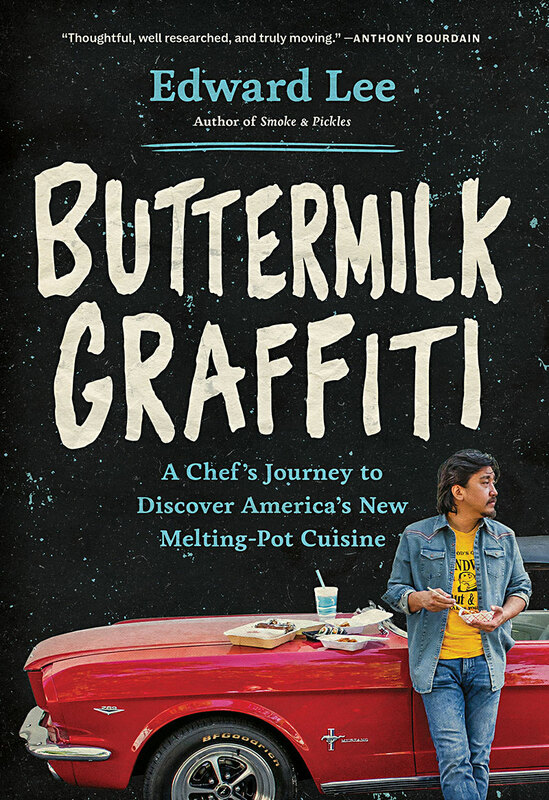 You could pretty much make anything you wanted and find inspiration in it from this book." She chose prawns, saying "Scarlet Feather is located in Ireland so I am taking blogger privilege and assuming that they used what we would call shrimp and they would call prawns. Frank just called them terrific!! And, from Debra of Eliot's Eats, yummy Chicago Style Pizza. She reports, " Binchy’s characters (and there are a lot of them) kept me fully engaged and I finished the book long before the July 31 posting deadline. (This is an unheard of occurrence; I am always up against the deadline.) ... I really enjoyed this read... There are so many characters, interwoven connections, emotion and humor in this book." Inspired by the wedding preparations for Cathy's sister, Marian, who is returning to Dublin for the celebration from her home in Chicago. Marian wanted typical Irish food. " 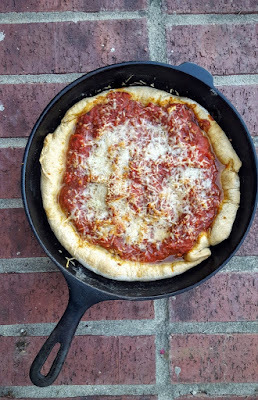 I, however, could not forget Binchy’s humor here and Cathy and Tom’s attempts to make everyone “feel at home.” They would have been spot-on if they had served Chicago-Style Pizza....After years of trying to replicate this style of pie for The Hubs (because it’s one of his favorites), I think I may have a winner here." Cathy has her monster-in-law to the Scarlet Feather premises for lunch and serves tomato soup (which Tom says that Hannah Mitchell will think is "tinned") as a starter with some of Tom's bread. It ends up that Mrs. Mitchell likes the soup and its "very sweet taste." Which incident inspired Deb's delicious sounding tomato peach soup. Cathy, from Delaware Girl Eats, provided us with Peach Scones. She says, "Since I am not too keen on long novels, I did not read this book but since Maeve’s work focuses on Ireland, I decided instead to explore Irish cooking as my contribution to the group’s current discussion." and joins us with an Irish inspired plate of peach scones, which sound tempting indeed. Tina posted at Novel Meals a scrumptious Landlocked Paella. She said, "one thing I love about this book (and most of her other books) is the portrayal of the average person. Who hasn’t had frustrations with their parents or disagreements with a mother-in-law (don’t get me started). It’s not a detective story or a thriller where sensational things happen. It’s a tale you can immerse yourself in as you can see some of those things happening to you. It’s everyday life.
" My representative dish is going to be a Landlocked Paella. Not your traditional seafood Paella because we have overloaded on salmon lately. Needed a break from the sea." 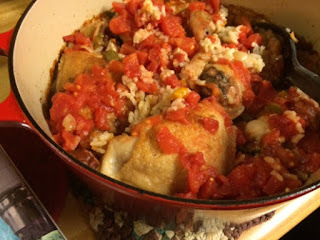 Vicki of I'd Rather be at the Beach also posted a Paella, Quick Chicken and Chorizo Paella. 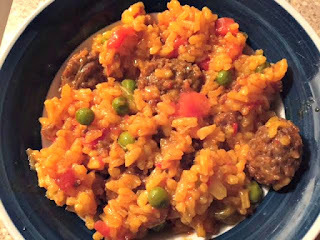 And reports on her reading, "It’s a bit longer than what I prefer, and I do think it could have been a shorter and still had the same impact on the reader, but it did flow along well enough to keep my interest...There were so many foods mentioned in the book... and I finally settled on Paella since I’ve never had it." In the novel, Tom is trying to set up a Spanish atmosphere for some clients and Cathy tells him, "that was all very well certainly, but they must have a whole range of tapas to start. Followed by a knockout paella with all the right flavors." Thus, Vicki has cooked up a knockout paella. 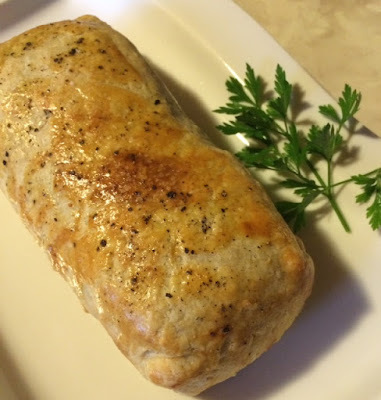 At Honey From Rock, I posted a shiso layered Salmon en Croute. "I was pretty sure I had read this novel sometime in the past, but to be honest, once I got (re-)? reading it, the story was absolutely new to me. Maeve Binchy was the starting point however. Knowing that I wanted us at Cook the Books Club to feature one of her wonderful novels, I selected this one for the culinary connection. And it does indeed contain lots of foodie inspirations. Among the many culinary mentions was "Salmon en Croute, which called to mind some wonderful meals we enjoyed in Ireland featuring salmon. A fish which also brings to mind an old Irish legend about the "Salmon of Knowledge." Perhaps eating salmon makes you wiser?" Finally, last but not least, we have Simona of Briciole with her rather exotic combination, Rhubarb and Berbere Cranberry beans. She enjoyed the book, and said "the story for me is about how even well-intentioned, generous, good people end up hurting others when they are focused exclusively on their personal goals. I think we can all relate to that.... The novel also shows what happens when someone is neglected for years. Simon and Maud are nine-year-old twins born from parents who don't pay attention to them." Consequently they have issues with food and eating properly. Simona says though her background was not dysfunctional, "Simon and Maud made me think of my eating preferences as a child. 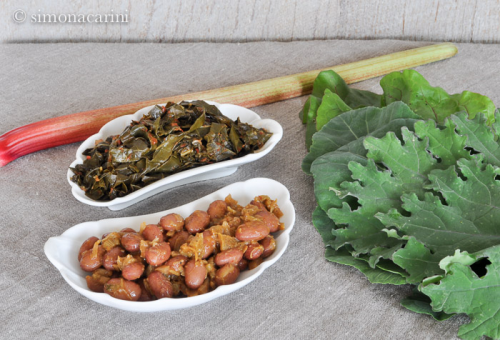 There is a long list of foods I didn't like then that I have come to like a lot: beans (fagioli) are high on that list .... In honor of Simon and Maud, I created a recipe using locally grown cranberry beans." That's it folks! If you missed out on this round and like books, food, and food themed books, please consider joining us for the August/September selection, The Secret Book of Frida Kahlo by F. G. Haghenbeck, hosted by Debra of Eliot's Eats. Hope you will join us! 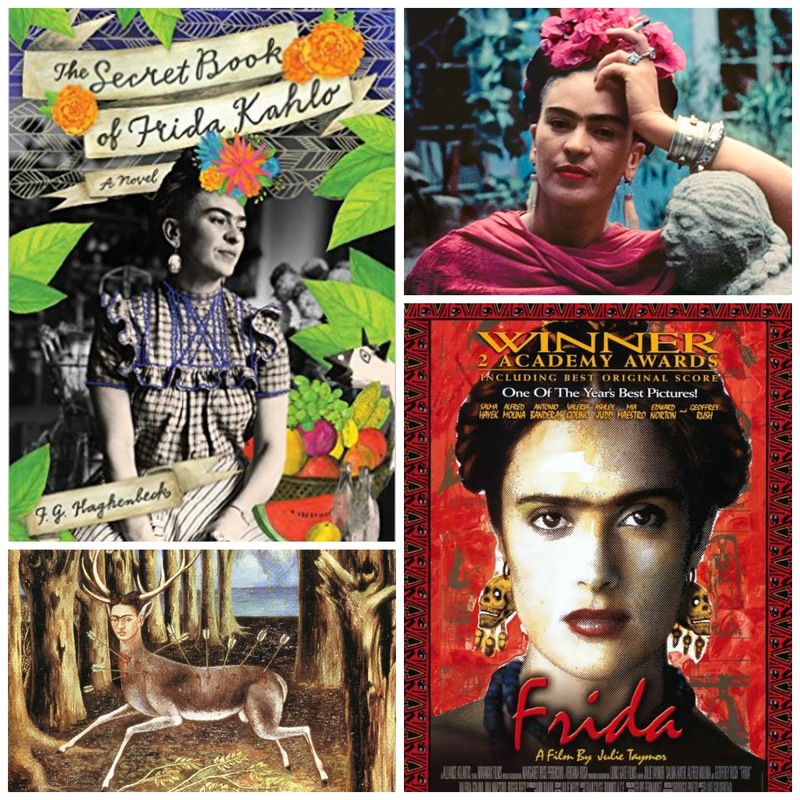 Haghenbeck discovered a small notebook belonging to Kahlo in one of her former Mexico City homes. 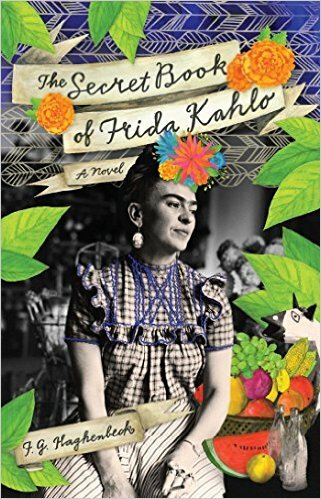 It is unclear to me how he got his hands on this tiny recipe book (or even if it ever existed) but nonetheless it was his impetus to write a fictionalized work of Kahlo's weird and wonderful existence. He focuses throughout on her obsession with Día de Muertos (Day of the Dead) and her obsession with Diego. Just as Kahlo sprinkled fantastical folkloric elements into her style of painting (sometimes classified as surrealism), Haghenbeck uses magical realism with fantastical and mythical elements to describe Kahlo's pained existence and creative soul. Because his catalyst for writing The Secret Book was based on a slim volume of recipes, sprinkled throughout the narrative are instructions for everything from Pico de Gallo to Mango Tepozteco Ice Cream. Submissions for this round of Cook The Books are due by the end of the day, Friday, September 30, 2016. Anyone can join in by reading the current selection, preparing a dish inspired by its contents, and writing about it. Contact me when your entry post is up by commenting on this post and/or sending me an email to eliotseats@gmail.com. New to Cook the Books? Check out our About and Guidelines pages or leave a question in the comments on this post. I am extremely thrilled to announce a partnership with Food 'n Flix with this CTB round's selection. I am also hosting the September feature for FnF: Frida, a film directed by Julie Taymor and starring Salma Hayek, Alfred Molina, and Geoffrey Rush (besides the rest of the all-star cast). Please consider joining in both events. 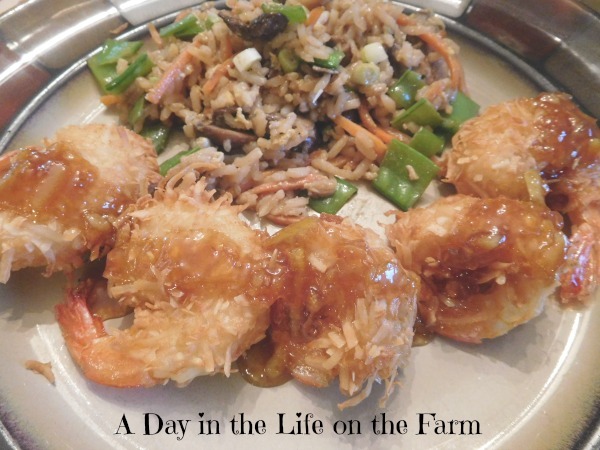 Feel free to post one dish for each or combine your dish to cover both events to post in September. More information about Frida and Food 'n Fix will be available September 1 on Eliot's Eats. Hope you enjoy and participate in both.